A rare videogame about zombies. Between the two Left 4 Dead titles, Call of Duty's zombie modes, and seemingly countless other games featuring the brain-eating undead, you might think that there's no room left for yet another zombie videogame. Konami and Backbone Entertainment beg to differ. Following up on the success of the 2009 downloadable title Zombie Apocalypse, Backbone Entertainment is developing the sequel, appropriately titled Zombie Apocalypse 2. It's the same basic concept, but Zombie Apocalypse 2 brings with it a new apocalyptic event, new characters, and a few new tricks. When I saw the first Zombie Apocalypse at E3 2009, I referred to it as "Left 4 Dead as a top-down, two-stick shooter." With four player co-op and hordes of the undead onscreen, it wasn't a very hard comparison to make. Zombie Apocalypse 2 still has cooperative play for up to four friends, but Backbone has made a few changes to distinguish the characters. Instead of being only different cosmetically with the exact same abilities and weapons, each character now has a different class: there's a brawler, an engineer, a healer, and an "assault gamer," each with unique weapons and abilities. There's also a progression system within each class, so characters can upgrade their speed, firearms, and special skills. This adds a little more strategy than just non-stop shooting from all directions, and actually makes the decision of which character to choose somewhat important. Zombie Apocalypse 2 also has more of a story than the first one, the basic plot of which was essentially "There's a zombie apocalypse, go!" This time around, motion comics between levels shed some light on the situation, and use of voice-over in the game adds personality to each character while revealing more about the apocalypse. There's definitely some humor to the dialogue, and thankfully, Zombie Apocalypse 2 doesn't take itself too seriously; it's a dark situation, but the game is just about having fun. The downloadable title will encompass five main levels, each of which have two sections. 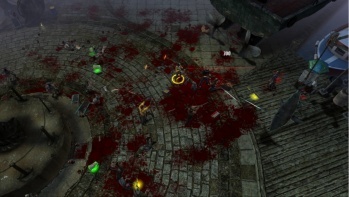 The different areas start off with some exploration, and end up in an arena swarming with zombies, leading up to the eventual boss fight to finish it off. The zombies get bigger and stronger as the game progresses, so teamwork will be important to make it to the end of the game. If you don't have any friends to play with, AI characters will fill the roles of your teammates, rather than leaving you to face the undead alone like the first game did. Because the system froze twice, I didn't actually get to play Zombie Apocalypse 2 myself, instead getting an eyes-on experience while talking to producer Mike Boccieri of Backbone Entertainment. It looks like the developers have done a lot to distinguish it from its predecessor, but ultimately it's hard to tell if it will be able to stand out among the many two-stick shooters and zombie games already available. If you're in the mood for some undead action this Halloween, it does appear that Zombie Apocalypse will, at the very least, deliver some mindless fun for you and your friends. Zombie Apocalypse will be out in October 2011 for the Xbox Live Arcade and PlayStation Network.